Having read part 1 and part 2 of this series, we should now have a better understanding of state machines, basic elements of the graphical modeling language and time-controlled state transitions. In the following sections we examine how model code is created from modeled state machines. 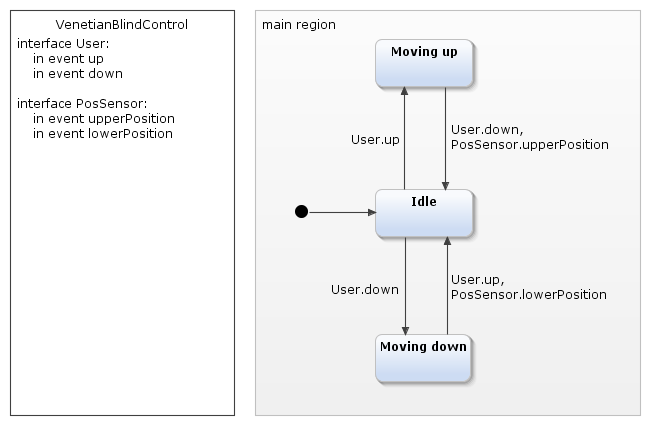 Whoever models the blind control system not only needs it as an example, but will want to use it to create a real control unit, and so needs executable code. We will look at different implementation approaches for state automata and preview the automatic code generation abilities of YAKINDU Statechart Tools. Various approaches are possible for implementing an automatic state machine in software. The most common is using a switch statement. Developers often implement state-of-the-art switches with switch instructions, even if they are not aware that they are state machines. Each state of the machine corresponds to one of the case clauses of the switch statement. The program jumps to the case clause that corresponds to the active state. Within this case clause, it executes state-specific statements, checks whether and/or which events are present, and activates a different state depending on them. In the event-driven approach, the state machine executes the switch instruction as soon as an event arrives. In the cycle-based approach, this is done at regular intervals. A combination of both approaches is also possible. Executing the switch statement and processing the current events is called run-to-completion-step (RTC). The basic structure of the implementation can be sketched very simply using the example of a traffic light, because each state of a traffic light is always assigned exactly one following state: red follows red-yellow, then green, then yellow and then red again. This state machine does currently not need any events, which results in simple and clear source code. We choose Java as an implementation language here, but of course this principle can also be implemented analogously in other programming languages. First we define an enumeration with all states of the state automaton, i.e. with the traffic light phases. The variable activeState contains the current status; this is initialized to red. The stateMachine method implements the actual state automata. Its core is a switch statement, which, depending on the current state, activates the next state by assigning it to activeState. In this example this occurs cyclically in an endless loop. The next example goes one step further and takes events into account. For this purpose we will return to the blind control, as shown in the figure below. For developers who are unfamiliar with Java, Collection<Event> is a data type that manages a group of event objects. The example uses an ArrayList<Event> as a concrete implementation, a list of event objects that is implemented internally using an array. If any other events arrive while Idle is the active state they are ignored: a state machine should respond by definition only to those events for which the respective active state is "sensitive". Several events may be present simultaneously. The lower the clock rate, the greater the probability is that a user will press both the [↑] and [↓] keys between two processing cycles. In this case, in the above implementation the [↑] key always "wins". If you want to give priority to the [↓] key, you must adapt the implementation accordingly. In the following parts of this series, we will learn about two other implementation approaches: the representation of state machines as a table and – as an object-oriented variant – the “State” software design pattern. In addition, we will take a brief look at YAKINDU Statechart Tools’ automatic code generation feature. To read the whole “How to use state machines for your modeling” series, download our whitepaper for free. Rainer Klute is the data protection officer of itemis AG in Lünen and also works as a software architect. As proofreader he checks numerous German and English texts before they are published. He also oversees the documentation of some YAKINDU products.